Natural disasters; History we continue to live with. Hurricanes did not even spare the churches. 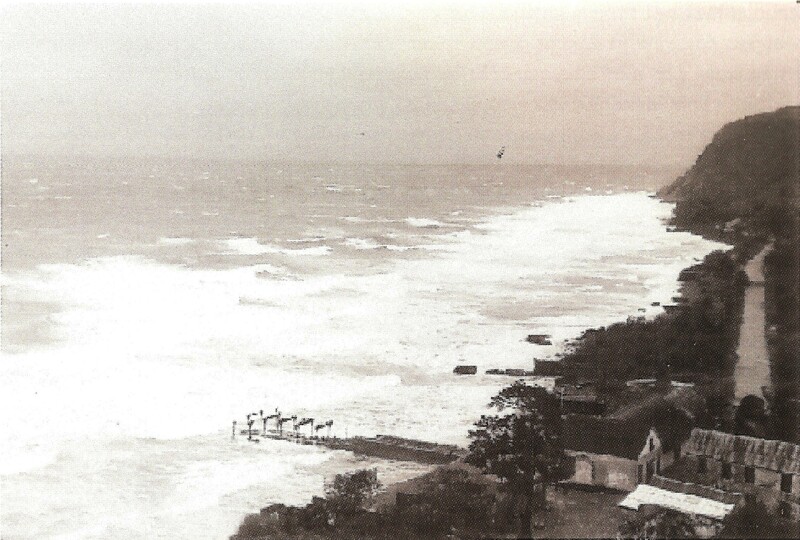 Here is a photo from 1928 after a hurricane in which the R.C. 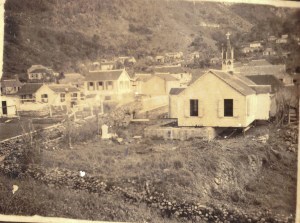 Church In The Bottom, Saba was blown off its foundation. With some jacks from the Dutch marines and Saba manpower it was placed back on its foundations. Starting with hurricane Hugo in 1989, the islands people would have to think that we are going through unusual times. This is far from the historic reality of our region. The late Carlyle Granger used to remind me of a sermon by Father A.L. 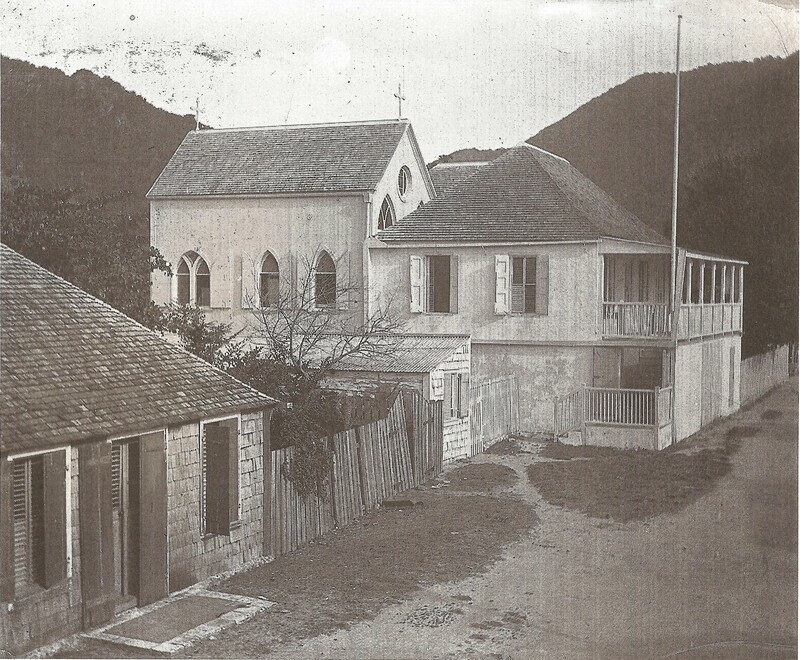 Cromie of the Anglican Church on Saba (1953 -1954). The sermon was on the occasion of the burial of the victim of the first fatal motor vehicle accident on Saba in 1954. Father Cromie, according to Carlyle advised that you cannot question God about everything that happens in life. He said that when you choose to live here you should be aware that you are living on a dormant volcano in the worst part of the Atlantic hurricane belt. Knowing those facts you could choose to live somewhere else. He did not mention tidal waves, and rocks falling down the sides of the mountain and killing people but we have had those too. The once lovely city of St. Pierre Martinique the Paris of the West Indies was toally obliterated by the eruption of Mt. Pelee in May of 1902. My great grandfathers knew this city well. Over 40.000 people lost their lives. Over the centuries there has been an awful lot written about natural disasters in the West Indies, including volcanic eruptions, the greatest of which being Mount Pele which destroyed the lovely city of St. Pierre in Martinique. I just finished reading Jean Rhys’ Book of Short Stories. She was born on the island of Dominica in 1890. Let me start this article with what she wrote about the eruption. “Ash had fallen. Perhaps it had fallen the night before or perhaps it was still falling. I can only remember in patches. I was looking at it two feet deep on the flat roof outside my bedroom. The ash and the silence. Nobody talked in the street, nobody talked while we ate, or hardly at all. I know now that they were all frightened. They thought our volcano was going up. “In the afternoon two little friends were coming to see us and to my surprise they both arrived carrying large glass bottles. Both the bottles had carefully written labels pasted on: “Ash collected from the streets of Roseau on May 8th, 1902.” The little boy asked me if I’d like to have his jar, but I refused. I didn’t want to touch the ash. I don’t remember the rest of the day. I must have gone to bed, for that night my mother woke me and without saying anything, led me to the window. There was a huge black cloud over Martinique. I couldn’t even describe that cloud, so huge and black it was, but I have never forgotten it. There was no moon, no stars, but the edges of the cloud were flame-coloured and in the middle what looked to me like lightning flickered, never stopping. My mother said: ‘You will never see anything like this in your life again.’ That was all. I must have gone to sleep at the window and been carried to bed. “Next morning we heard what had happened. The Roseau fishermen went out very early, as they did in those days. They met the fishermen from Fort de France, who knew. That was how we heard before the cablegrams, the papers and all the rest came flooding in. That was how we heard of Mont Pele’s eruption and the deaths of 40,000 people, and there was nothing left of St. Pierre. I have often referred to Lafcadio Hearn’s book which forms part of my library.” Two Years in the French West Indies” gives a vivid description of life in St. Pierre. According to Jean Rhys it was described as a wicked city. The women were the prettiest in the West Indies. Even the married women tied their turbans in such a way to indicate that they were “free.” The last bishop who had visited the city had taken off his shoes and solemnly shaken them over it. After that, of course, you couldn’t wonder. On the 27th and 28th of April in the year 1812 there was an eruption of the volcano in St. Vincent. On Barbados the people woke up finding the island under a thick layer of ash. It was not until days later that word arrived of the eruption and solved the mystery of the ash. This ash, by the way, fertilized the cane fields on Barbados for the next 100 years. 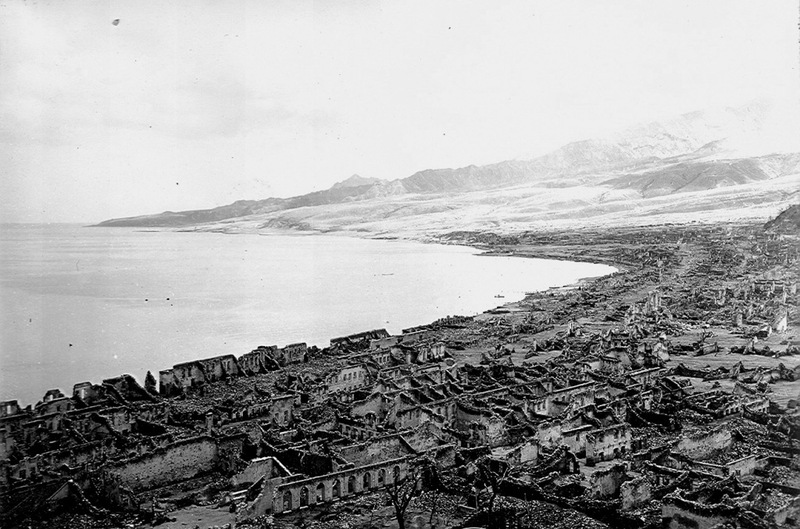 Again in 1902 a few days after the Martinique disaster the volcano on St. Vincent erupted with loss of life and with nearly the entire Carib Indian population wiped out as a result. 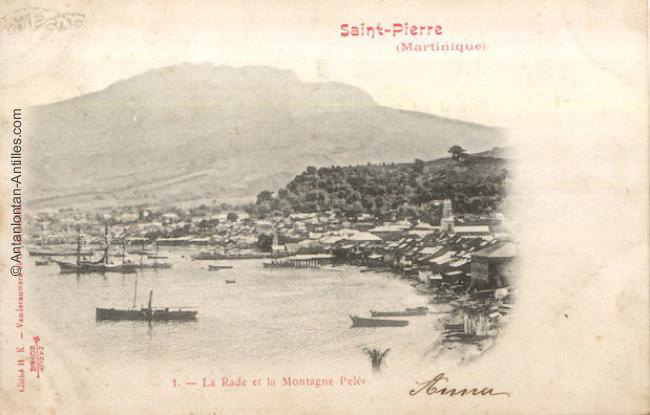 St. Pierre once the loveliest city in all of the West Indies, completely destroyed by volcanic eruption in May 1902. One Saban Roland Hassell lost his life on a schooner in the harbour in that eruption. My grandmother used to tell me that they heard the explosion all the way on Saba and it turned dark in the afternoon and ash fell here on Saba. Carlson Velsasquez told me that as a boy Miss Helena Buncamper (died aged 92 on 17.04.1958, born 1866) used to tell him stories about that tidal wave. My grandmother Agnes Simmons used to tell me about St. Maarten tidal waves as well and she also claimed that a large wave had come in through the gut below the airport on Saba and had washed down into the Cove Bay. Also teacher Frank Hassell tells me that in the nineteen fifties there was a report on St. Maarten of a tidal wave coming , and that Miss Browlia Maillard had decided to go to French Quarter to stay by friends but nothing came of it. The New York Times of December 2nd, 1867 reports the following under the headline: WEST INDIES. Earthquake and volcanic eruptions at St. Thomas, Saba and St. Domingo. On Saba on February 8th, 1843 there was a strong earthquake with serious aftershocks taking place in the days following. St. Martin experience at least twice tidal waves. In my book “For The Love of St. Martin” i write about it.Even on Saba once there was one that came in through the Savannah pond and went overland into the Cove Bay. Dr. J. Hartog also mentions that the earthquake of 1867 cause rifts in the earth on Saba and resulted in the mountain smoking and gasses escaping. He also claims that this happened again in May of 1920. However I interviewed a number of old timers formerly who could remember nothing of the 1920 claim. Hurricane “Alice” passing Statia on January 2nd 1955. They can come at any time of year. There was one once in March 1908 in which a Saban schooner and all its Saban crew were lost when leaving St. Kitts. The Dutch Windward Islands had historic great hurricanes as well. In the hurricane of 1772 the only church and 100 houses on Saba were severely damaged or destroyed. Cotton and coffee plantations were destroyed as well. In September 1890 the hurricane destroyed 20 straw huts and 1 wooden house in The Bottom. Windwardside which was the worst hit lost 32 straw huts and 38 wooden houses. Many people had to live in caves after that including my great-great-grandfather Jacob Vlaun where on Hell’s Gate a cave is still named after him. Of course as soon as they could the Sabans rebuilt their lost houses and no longer had to sleep in caves. Many of the hurricanes which hit Barbados in ancient times also ended up here by us. Records indicate severe hurricanes in 1670 – 1674 – and a most terrible one in 1675 (August 31st) which swept the island of every house and tree except the few that were sheltered by some neighboring cliff. There were also hurricanes in 1700, 1702 and 1731. However the hurricane of 1780 known as the “Great Hurricane” which reportedly killed 25.000 people in the West Indies was the greatest of them all. Even on St. Eustatius where it arrived on October 12th, it was reported there were 5000 dead. In checking the population figures for that time I think it must have been around 500 dead, still a considerable amount of people. The old timers even claimed that the doors of the Dutch reformed Church on St. Eustatius had been found close to where I live on “The Level” here on Saba. The Saban owned schooner the “Ina Vanterpool” lost in the Sweptember 1928 hurricane off the town of Oranjestad, St. Eustatius. 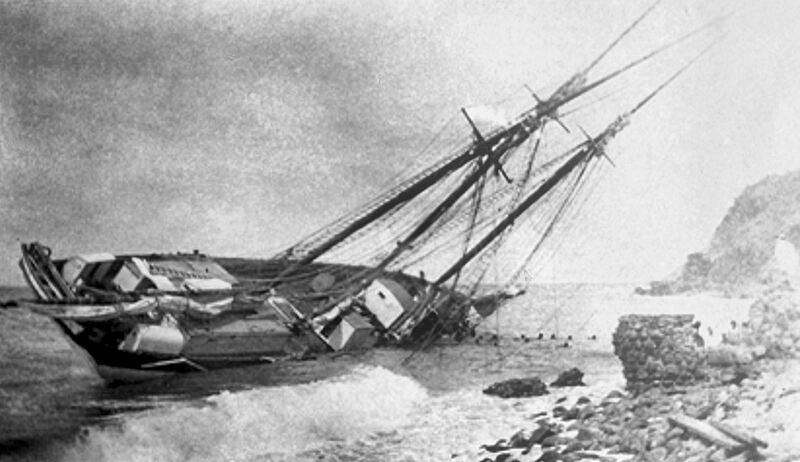 Many Saban owned schooners and their crews from Saba found a watery grave in times of hurricanes. In my book “Tales From My Grandmother’s Pipe” there are many stories of men lost at sea from Saba in times of huricanes. A report from Barbados gives an idea of the great hurricane. “On the 10th of October of the year 1780, the heavens at an early hour were overcast with a most dismal darkness, and the unusual aspect of the clouds plainly indicated the devouring storm. At dawn of the day the wind, rushing with a mighty force from the North-West, was accompanied with heavy rain, and before midday many buildings in different parts of the island were in ruins. Towards evening the storm increased, and at 9 o’clock had attained its height, but it continued to rage till four next morning, when there was a temporary lull; but like a vindictive tyrant, who in his expiring moments, is insatiate with the carnage of his strength, it struggled to complete the work of desolation and death. “Before day-break, the cattle and the forts, the church, every public building and almost every house in Bridgetown, were leveled with the earth. This visitation was ever afterwards denominated as the Great hurricane, for it was not until August 10th– 11th, 1831 that a greater occurred. “In July 1831 in Barbados there was an unusual quantity of rain; it, indeed is said to have rained almost incessantly and caused 2500 deaths and 5000 wounded. The description given of the hurricane of 1780 on Barbados can be applied to the hurricane of September 21st, 1819 which destroyed St. Martin. More than 200 people died, 384 houses totally destroyed, Simpson bay was cut off from the land by The Corner and remained isolated for the next 120 years or so. In 1829 when Dutch historian M.D. Teenstra visited St. Maarten he said there were only 26 houses in Philipsburg which were partially useable and the economy was totally ruined. On St. Eustatius it rained from to April 7th to April 13th, 1792 and even swept people out to sea and destroyed warehouses on the Bay. Also on November 1st, 1755 there was an earthquake on St. Eustatius and again on July 11th, 1785 there was a severe earthquake on St. Eustatius which reportedly lasted for two and one half minutes. This happened while church services were going on and the congregation and the preacher rushed through the doors and jumped through the windows of the church. Since hurricane Hugo in 1989 the islands have had their share of hurricanes, such as Luis, George, Lenny, Marilyn and many more which names we have forgotten by now. Also on the island of Montserrat the volcano started erupting and caused the destruction of Plymouth and the departure of two thirds of the population from the island. And while I was writing this a man presented himself on my porch, said he was God and from Holland and had come to warn me that before Thanksgiving the world will be destroyed. I could only get rid of him by promising that I would mention that he, God had been told that I was the smartest person on the island and through me he wanted to warn you all. So we will wait and see if this God from Holland knows what he is talking about.